Apparently, Jean Todt has been maintaining that he and Luca di Montezemolo get on well, even though they might disagree on occasion. This is to counter recent rumors that the pair have fallen out. Which would be all very well except that the rumors are not recent at all and date back at least as far as Michael Schumacher's announcement of his retirement. 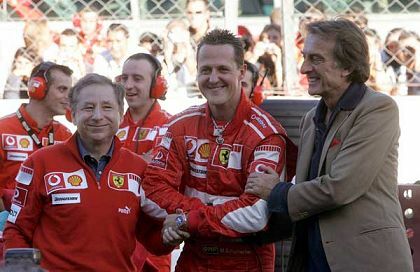 At that Monza GP in 2006, when Michael was celebrating his victory and about to proceed to the podium, many observers noted how he seemed to ignore Montezemolo, who was hovering nearby and hoping to share in the glory. With Michael's announcement, the speculation started; Montezemolo had wanted Raikkonen in a Ferrari, Todt and Schumacher had disagreed and, when Luca insisted, Michael had resigned. This was all a little far-fetched, perhaps, but there seemed to be tensions in the camp even so and the rumors would not go away. When Todt continued to function as sporting director of the race team in spite of being promoted to Ferrari CEO, and then Ross Brawn did not return, ending up at Honda instead, it looked as though Todt was holding on grimly to the job he really wanted. But now Todt has definitely handed over the reins to his successor, Stefano Domenicali, and all is sweetness and light, we are told. Todt can bask in the glory of Ferrari's victory in both championships while Luca insists that their main opposition came from a car that was heavily indebted to Ferrari ideas anyway. Things become so relaxed that Todt can even claim to have been the one to put Kimi in the car. The one jarring note was Todt's admission that Michael Schumacher was offered his job but turned it down. That seems fair enough until one thinks about Domenicali's place in all this; how must he feel now that Todt has announced to the world that Stefano was only the second choice? The statement was unnecessary, water under the bridge at best, and one wonders at the motivation behind it. Could it have been an attempt at the last word, a hint that he did not want to relinquish the race team and a parting shot at Luca's choice for team boss? At the very least, it is an admission that things did not go all Todt's way in the restructuring of the team. There is also the fact that, if Michael was offered the job, Ross Brawn was already ruled out as a possibility. Ross had been quite open from the start about only returning if he could be team boss - so what were all those discussions about this summer, when everyone knew that the job was already the property of Domenicali? Could it be that Ross was being given a bit of a run-around? It seems to me that there has been some substance in the rumors and that Ferrari is as riddled with internal politics as ever. What Luca's motives might have been in breaking up so successful a team, I do not know, but there is no doubt that he was deeply involved in it. Naturally, Todt would have wanted to preserve as much of his original team as he could but it is clear that he has lost. Ferrari is Ferrari and not even Jean Todt has been able to change that in the long run. And that is good news for me, at least. It has been a long time since I was last able to enjoy Ferrari as the epitome of the Italian racing team, all power and passion, plots in the boardroom and panache on the circuit. Here's to Luca for giving us back the real thing, instead of some Anglo-Franco-German imposter. And if the rumours are to be believed Alonso is going to turn up next season. Just gets better and better. He will get there just as the whole thing starts to implode and chuch oil on the fire. That's one rumour that I don't believe, actually, Roy. But if it's true and Alonso really does end up there, that should be some show! Rumors and conspiricies, I love it! Alonso to Ferrari in 2009? Why would Alonso want to race along side Kimi and of course be positioned as Ferrari's #2 driver? I suppose if the 2008 Renault is another flop, ANYTHING would be better than a bad car, but other than that, why Ferrari with Kimi? I don't understand it myself but with the mutual admiration society he seems to have with Todt in particular you have to wonder. OH! I just figured it out ...... it will be Alonso and Massa at Ferrari. There now it all makes sense. Ah, nothing like a good implosion to spice things up a bit ! Actually, I wouldn't rule out the possibility of Alonso and Massa at Ferrari in 2009. Kimi's always been quite clear he does not want to "go on and on" and if he were to win a second title in 2008, who's to say he wouldn't go off to race snow mobiles in his native Finland? The sad situation in F1 is drivers are not personal atheletes as in golf or track & field or tennis, etc., they are unfortunately EMPLOYEES of the teams. It's also a shame that there is such turn over. One year, two years, look what old Flav did to Kovalainen, some drivers are dropped mid-season......you don't see that at the real pinnacle of motorsport, NASCAR drivers last forever! Mark Martin drove for the same team for 19 years!!!!! 10 years with the same team is common, why is there such instability in F1?